The past while, I've been running 5 times a week and following a training program which should allow me to complete my upcoming half marathon in about 2 hours. This is a bit of a big deal for me as the times I ran a half marathon in the past (the last one being in 2004...), I didn't really follow a program. I just ran when I felt like it, and for as long as I wanted, with no real attention to what kind of running I was doing. I'll get into kinds of running another time, but the point I'm trying to make here is that running 5 times a week is a lot more than I was previously used to, and it doesn't really allow me to do much else, workout wise. There are, after all, only 7 days in a week, and the other 2 days (Mondays and Fridays), I'm supposed to rest completely. That is, maybe go for a walk, but not do anything where I might break a sweat, to allow my body and muscles to recover from the stress of previous runs and be ready for the next set. Running 5 times a week so far has been really beneficial. I think after a while of running a little here and there, I'd plateaued in my fitness level. I was fit and healthy, but not making significant improvements in anything anymore, as I wasn't challenging myself enough. Now I'm running all the time, and I'm forcing myself to do distances that I might not have necessarily chosen to do otherwise on a particular day. Putting it into my calendar that on this day I'm going to run this much and that day I'll run that much, makes it happen. I have no choice but to make time for it. I'm running when I feel like it, and when I'm not really feeling like it. They are in my appointment book and have to be kept. Now, as a result, certain distances feel effortless, longer distances don't seem so far out of reach, and I'm noticing a difference in how I feel and look, especially in my legs. So advice to anyone who says "I can't run past x distance"..... my answer is simple: run more often and then you can run further. Ok, I need to confess that I lied a little. I've not exactly been running 5 times a week every week. Most weeks I've been hiking the Grouse Grind once or twice in place of one or two of the runs I'm supposed to be doing, so it all adds up to 5 workouts in the end. I never replace a long run (my Sunday runs), but often replace a short run I would have been doing on a Tuesday or Thursday with a hike up the Grind. I'm a little hesitant on how to classify the Grind though, in terms of my half marathon training. I'm inclined to call it cross training, but at the same time, I feel it's too related to running (even though I brisk walk, not run, but up a very steep mountain) and I think it simplifies things to just say, "I run 5 times a week" and not clarify the little white lie. What do you think? How would you classify it? What I do know is that hiking the Grind is a nice challenge, with great reward when you reach the top, and it makes my Wednesday hill repeat sessions feel like a piece of pie. It's clearly benefiting my leg muscles, but with way less impact than pounding the pavement running. My understanding of true cross training is that you pick an activity that isn't running, that helps build your overall endurance. This will no doubt make you a better runner. The thing is though, that the best cross training is where you use a different set of muscles, so that your running muscles can heal and rest, but your cardiovascular system is still getting a workout. There's no direct benefit to your running muscles, but your overall fitness is still improving. A great example of cross training for running is swimming. It's a great cardio workout, that uses mainly your upper body (I'm referring to a freestyle / front crawl type swim). So it gets the heart-rate up, but allows your running muscles to rest and have a workout with zero impact. And like running, it's very meditative. I appreciate being hyper-aware of my breathing, my inner thoughts, and the strength in my arms. What's your favourite cross training activity? Today I had an hour to kill whilst in downtown Vancouver. I decided to treat myself to an hour at Chapters bookstore. And naturally, I picked up a book! If I wasn't both ready for bed, and yet somehow compelled to blog, I'd likely be up all night reading. The book has already grabbed my attention, and I'm quite excited to sink my teeth into this read. I picked up a copy of Born to Run by Christopher McDougall. Nothing like one (yes, just ONE) of Cam's home-brewed beers as an evening treat as a reward for an awesome 14km run today. Did I mention that one of the reasons why I love running is that I love pasta (dinner last night) and beer? Mmmmm, carbs! 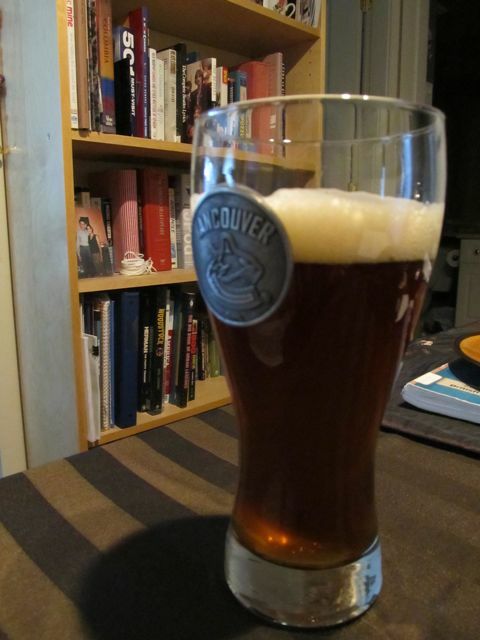 And yes, that IS a Vancouver Canucks beer glass! Naturally we depend on our feet the most when we run. The poor things have to endure all kinds of stress during a run, with the weight of our bodies pounding down on them with every step. It's super important that we treat our feet well and go over and above to keep them happy, especially if we're running regularly. Many people who suffer from foot pain or joint pain elsewhere on their bodies due to running experience the discomfort because of their footwear. Either they're not wearing the right shoes, or the shoes have been used too much and thus passed their "best before" date. There's all kinds of info out there on how to select the right shoes, and staff at most specialty running stores will be able to offer valuable advice. I'm not an expert, and my knowledge may be severely flawed, but here's what I've been doing to keep my feet happy. I always find it funny to use the term "running fuel" or to say that I'm "fueling up" before a run. Maybe it makes me feel tough, or like a machine. It implies that I can run fast, hard, and for a long time, and all I need to perform is some food. I like the image. There are days where I do feel like a machine. My legs carry me where I need them to; I don't have to think much about it, but simply enjoy the experience. I'm curious what your go-to running fuels are....and I'm talking about what you eat/drink before, during, and for recovery. I've been testing out a few things and finding what works for me. I also have been reading tips from various sources including Runner's World magazine, #Runchat, and various runners I'm following on Twitter. I've experimented with some of the tips to try to find what works best for me. It's a work in progress, but I've found a lot of things that work well for me. Nobody is born a marathon runner. But anyone could be born capable of running a marathon. Unless there is a physical limitation to prevent this (although there are the inspiring few who overcome even this), with determination, training, and nutrition, you (and yes, I mean YOU) can achieve your running goal. So how did I start? In my previous post, I mentioned how I once loathed running. In high school PE class when we had to run laps around the field, I'd be gasping for air after the first ~400m lap, if I was actually lucky enough to complete the lap. I hated my teacher for forcing us to run and though only negative thoughts about how I couldn't and would never be able to run. 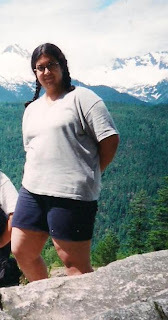 Again, this is not a weight-loss blog. But it's obvious that health and fitness go hand-in-hand. And I thought that showing photos of my journey will allow you to get a better sense of where my life has taken me in terms of health, and why I started this blog. This is especially for those of you who don't know me at all, and also for those of you who have known me just a little while. The first post of my new blogging journey, here we go! While out today, running up my 4th hill repeat with the hot sun beating on me, my heart pounding in my chest, sweat dripping down the back of my neck, feeling the burn in my quads, my thoughts to myself revolved around two questions: (1) Why do I run? and (2) Why am I not writing about why I run? I'll get into item #1 momentarily, but clearly item #2 is the reason behind this blog. I love writing, and I certainly have a LOT to say on the topic of running. While I'm not an expert at running, I'm no beginner either. My long journey as a woman who has struggled with health, weight management, and all the insecurities that come with it has led me here down the path of becoming an athlete. I'm proud of my accomplishments, I've established strategies that work for me, and I have my sights set on a future of being fit for life. This blog is primarily a chance for me to document my journey, and doing so for me to hold ME accountable to myself. But I chose a blog format because I thought that in writing my thoughts down publicly, perhaps readers may better understand me, they may relate to my journey and maybe even find wisdom in my words that can help them in their own health and fitness goals.